Jump on a quad bike and explore the purpose-built track through meadows, streams and bush on our 15,000 acre Woodbank Station property. 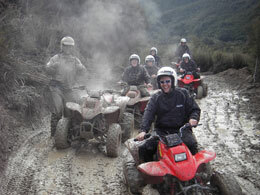 Get ready for the adrenaline-pumping thrill of a real quad bike adventure, with river crossings, hill climbs, humps and bumps, all set in the magnificent scenery of the Hanmer Basin. 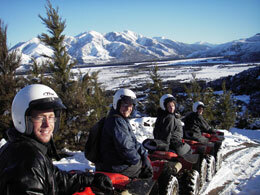 Ride the Honda Sport Quad Bike through our working farm, complete with sheep and cattle! A great ride for all levels and abilities! Get a good splash crossing rivers, lots of action and excitement! Want to ride longer? No problem! The Mountain Spectacular combines river crossings, hill climbs and exceptional views all in one must-do trip designed to give you a great experience in our beautiful Hanmer Springs! Purpose built two-seater bikes are available for passengers. Departure times: 10 am, 1.30 pm (subject to change) or on request. Please contact us to enquire about group and corporate rates.